An amazing manga the translation for which has just been complete the story takes a slightly surreal setting and makes it feel so human. A Shoujo Ai love story that is ever so slightly lude. Its short with just 17 chapters and one untranslated prequel chapter. The story has ups and downs but it in no way detracts from the over all experience instead it enhances it making it all the more real at a very slow pace the story might take you 2 1/2 hours but the chapters are short and you could easily complete it in a hour. the story has quite a vivid look at being an introvert and what it means for people as well as conforming to social pressures. its a light yuri with a great story not to be missed. With an upcoming adaptation, I'd thought I read, and ultimately review this short Shoujo Ai (Girls love) manga. What greatly differentiates this series from others of its genre is its sci-fi premise. The protagonist is overtly shy and through her sheer will of panicking under pressure has conjured up the ability to stop time. The catch is she only has three minutes out of a day to utilize it. This is her alone time where she is allowed to roam freely with no anxiety. She exploits her power by looking under the skirt of Haruka, the most popular girl in class and is shocked to find out that Haruka is the only person who isn't affected by her power. As awkward as their first encounter was, they begin to share this secluded time together. With only two volumes, the mangaka doesn't waste time to get to the root of its story. The relationship in this series is a familiar trope you might've seen before: a shy girl starting a relationship with the popular girl in school. The dynamic between the two is cute, but even with its short length, the main character's insecurities of whether or not the popular girl is actually in love with her gets tiring and played out. Despite it's sci-fi premise, it doesn't have any further features that compliment the genre, in fact there's even plot holes in the science itself. If you pause time, you would have to move back into position in order to not cause a scene yet despite this, the main character bolts mid conversation multiple times and somehow is never questioned by other characters. This might seem like a nitpick, but I should be upfront with the "sci-fi" tag so that if you're one of the few extremely interested that this shoujo ai series has a sci-fi twist, just know that it stops there. I consider the art to be the biggest detriment to this series. The reason why I think it'll likely affect your enjoyment is because I'd imagine people looking for a shoujo ai manga have high expectations for an appealing art style and memorable character designs. The art style isn't bad by any means, but it doesn't do anything to set itself apart, or even enhance any of the girls features. Every girl character in here looks practically the same, and they can easily fit in with the background characters of other series. The art is simple, and the paneling can be awkward at times with me sometimes not noticing that the main character stopped time. Manga is essentially pictures. It looks frozen by default; if you don't draw anything that signifies something went motionless, the reader won't follow. It was fairly enjoyable. It starts off exciting and the story continues to introduce conflicts and gives a bit of room for the characters to have more depth in the end. Ultimately the two characters are cute, and their relationship is pretty wholesome. I would recommend this if you're into Shoujo Ai and want a quick read, but this wouldn't be my first recommendation for someone looking to get into the genre as the characters and art style leave a lot to be desired. Here's my take after reading 18 chapters of the time stopping shoujo love of Fragtime by Sato. 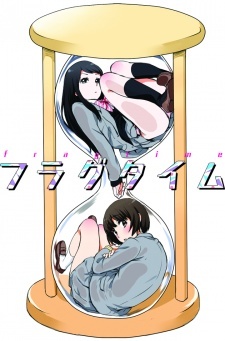 Fragtime is the story of the shy and reserved Misuzu Moritani and her ability to stop a "fragment" of time once per day. This is the only time that she can be true to herself and fulfill her fantasies and escape problematic confrontations. Everything had changed when Haruka Murakami the model student of her class noticed Misuzu's time stopping in the most uncanny way. The story for me didn't have to much impact although I gave it a pretty good score due to the fact that it the story is light and true to the feelings of the characters. The art is clean an light and matches the zest of the story. Misuzu and Haruka's characters may look like two sides of the same coin, but after reading it till the end reveals that they aren't which make it really interesting and touching till the end. I believe that one way or another, as a reader, you can relate to these two lovers. And with that said, I would give fragtime 8 grains of hourglass sand out of 10. "For me lately, what I find fun is stopping time and observing other people"
Misuzu and Haruka begin their strange relationship when Misuzu discovers that Haruka is immune to her time-stopping ability. The story revolves around the requests that Haruka makes and the effect of those requests. Some turn out harmless, others not so much. The story is easy to follow and mostly lighthearted in its approach. The art is simple and clean. No confusing a character for another here, even though the style is simple. Misuzu is what society calls an introvert and loner whereas Haruka is an social butterfly and class idol. The characters don't stay like that, they develop more. Some actions which seem to strengthen their image actually have something more to them. When the two of them interact, Haruka is usually teasing Misuzu, much to her embarrassment. They have a nice bond by the end of the manga and you can see how they influenced each other to change. This yuri manga is great. There are plenty of funny moments and relationship-building moments. Before I knew it, I finished the whole thing. Just try it, I'm sure you won't regret it.